The Center for the Study of Education Policy at Illinois State University just released a new report on birth-to-third grade alignment efforts from across the state of Illinois. The report was prepared by the Birth-to-Third Grade (B-3) Continuity Project for the Illinois State Board of Education. 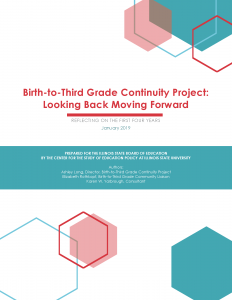 The Birth-to-Third Grade Continuity Project: Looking Back Moving Forward, Reflecting on the First Four Years report represents the efforts and collaborative accomplishments of four years of work at the state level and in communities throughout Illinois by early childhood stakeholders. These stakeholders include a range of perspectives—programs, schools, community collaborations, state agencies, higher education, and advocacy. Using a selection of case studies from communities that received Preschool Development Grant—Expansion (PDG-E) funding and technical assistance to develop and implement birth-to-third grade alignment strategies, the report provides reflections and insight from the work undertaken. We hope that this analysis can help to encourage the next iteration of innovation in birth-to-third grade alignment efforts as well as to help those states and communities just embarking on this journey. A summary of high-level, key findings drawn from the case studies through individual analysis as well as structured group conversations among community leaders. More in-depth information on the birth-to-third grade alignment strategies with real life examples from the participating communities. The complete set of five community case studies. A synthesis of a 2018 conference session where community leaders reflect on and answer questions about their B-3 alignment work. Please visit the B-3 Continuity Project’s website for additional information about the project and upcoming B-3 Continuity Conference. Questions can be directed to Ashley Long, B-3 Continuity director.